I was studying the book of John, and came across this in chapter 11, verse 33: 33 When Jesus saw her weeping and saw the other people wailing with her, a deep anger welled up within Him, and He was deeply troubled. Eventually Lazarus is raised from the dead by Jesus. 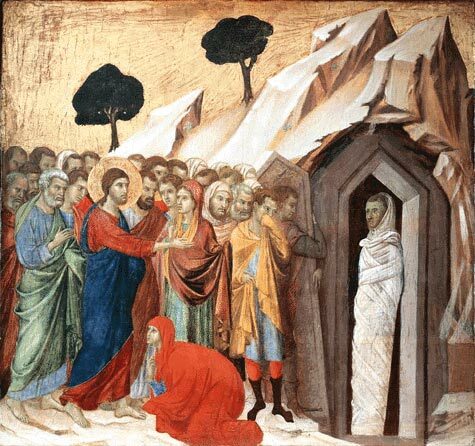 But even after being miraculously raised from the grave, Lazarus would still be held in death’s power. He would die again. We know that. Has anyone seen Lazarus lately? Where’s Lazarus? Jesus is not a passive bystander in this Death narrative of Lazarus … or of the human race. He came to destroy the works of the devil. The worst result of Saran’s work is Death. This enemy (Death) and Jesus are standing face-to-face in this chapter. And see it!! He is deeply moved. And He’s angry. But He’s not at Lazarus, or his sisters, or the mourners. His strong feelings are reserved for Death, and behind Death, Satan. And He was troubled heauton (‘eαυτον) in Himself! No outside force is acting on Him. He was stirring Himself, from way down deep inside … down in His spirit. He was stirring Himself to battle Lazarus’ enemy, Death. In John 11, the long struggle between good and evil comes into focus. The many years of Satan’s assault on the human race troubled Jesus in His spirit and He desired to put an end to the horrors of Death which plagued and plague the Human Family. The war … the conflict began in the Garden of Eden! The struggle involves every man, woman and child from Adam on. No wonder the Lord groaned and snorted and was troubled! He feels the sorrows and pains of His children … His friends … His followers … and the whole human race. In effect, Mary and Martha’s trouble became His own. 3 He was despised and rejected — a man of sorrows, acquainted with deepest grief. We turned our backs on him and looked the other way. He was despised, and we did not care. 4 Yet it was our weaknesses he carried; it was our sorrows that weighed him down. And we thought his troubles were a punishment from God, a punishment for his own sins! 5 But he was pierced for our rebellion, crushed for our sins. He was beaten so we could be whole. He was whipped so we could be healed. 6 All of us, like sheep, have strayed away. We have left God’s paths to follow our own. Yet the Lord laid on him the sins of us all. Lazarus’ enemy, Death, was also Jesus’ enemy! But Lazarus, Martha and Mary could not stand on their own before Satan and Death. They had no power to stand against the power of such an enemy. Satan’s opposition to Lazarus was another of his efforts to destroy God’s creative purposes. The enemy of man is in reality the opponent of God! Satan uses darkness, deception and death. Jesus combats him by the power of the Resurrection. The next time you wonder, “Where was God when this innocent child was abused?” or “Where is God while all these people in Somalia are ruthlessly starved by warlords?” or “Where is God in my battle with cancer?” and a thousand other questions … read John 11. God is there! Present. And His solution to Death and evil and disease is always the same: Life! Resurrection! But resurrection and life may not come in the way you thought, or even hoped. But it will come!